Facebook does not provide an official way to confirm if someone has blocked you on Facebook. However, there are definitely some reliable ways of finding if someone has really blocked you on Facebook. When someone blocks you on Facebook, you do not receive a notification from Facebook informing you that someone has blocked you on Facebook. This makes it difficult to figure out whether someone has really blocked on Facebook or this Facebook Friend of yours has simply deleted his/her Facebook Account or has been banned by Facebook. There are many Apps that claim to have the ability to Find If Someone Has Blocked You on Facebook. However, it is difficult to find out which of these Apps are actually trying to help you and which ones are just trying to get your personal information. Hence, we are providing below some of the methods to find out if someone has blocked you on Facebook. The first indication when someone blocks you on Facebook is provided by your Friends list. 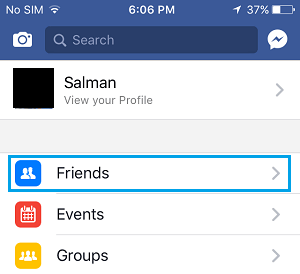 Open Facebook on your iPhone or Android Phone and tap on the 3-bar Menu icon located at the bottom right corner of the screen (in case of iPhone) and near the top-right corner of screen (in case of Android Phone). 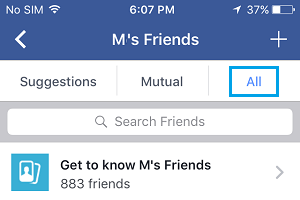 On the next screen, tap on the Friends option and go through the list of your Facebook Friends. 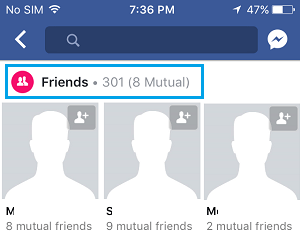 If you cannot find this particular Friend of yours in the List, it is an indication that you may have been blocked on Facebook by this Facebook Friend of yours. However, it is also possible that this person may have closed his/her Facebook Account or has been banned by Facebook. Type the name of your Friend in Facebook’s search box and see if his/her Name appears in the search results. If the Name of your Facebook Friend does not appear in search results, it indicates the possibility that this person may have blocked you on Facebook. However, it is also possible that your Facebook Friend may have decided to make his/her profile non-searchable on Facebook. To confirm, search for your Friend on Google and see if his/her profile comes up in Google Search Results. Open Google on your Phone or computer and type your Contact’s Name + Facebook into the search box and hit the Enter key. If the Facebook Profile of your Friend comes up in Google search results (while it was not coming in Facebook search), it is another indication that your Contact has most likely blocked you on Facebook. Another way to find if someone has blocked you on Facebook is to search for the person who you suspect has blocked you using Facebook Profile of a Mutual Friend. Login to your Facebook Account and open the Profile of someone who you know for sure is a Mutual Friend with you and the person who you suspect has blocked you. Next, tap on Friends option to open the Friends List of this Mutual Friend. While you are still on Friends List page, tap on the All option located at the top right corner of your screen. Next, type the Name of the Friend that you believe has blocked you on Facebook in the Search Bar and hit the enter key. If the profile of your Friend/Contact appears in the search results, it indicates that your Friend has not blocked you on Facebook. 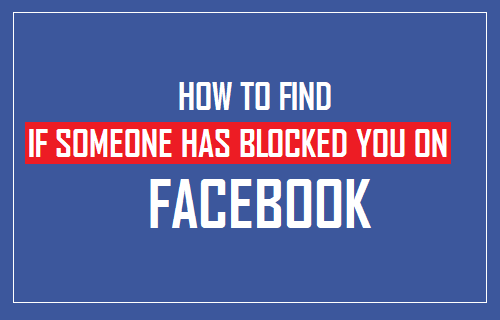 However, if the Profile of your Friend does not appear in search results, it provides a good indication that your Friend has most likely blocked you on Facebook. Ask your common friends if they can view the profile of this Person in their Facebook Accounts. If your friends can view the profile and you cannot, it further confirms the possibility that this person has blocked you on Facebook. If you are able to access the profile of this person in your Friends List, see if you can post something on his/her Facebook Wall. In case you are unable to post on your Contact’s Facebook wall, it is an indication that you have been partially blocked on Facebook. However, you also need to be aware that your Contact may have decided not to allow anyone to post on his/her Facebook wall. To confirm, try sending a Message to your Contact on Facebook. If you are not able to send a Message, it is another indication of being blocked on Facebook. Login to your Facebook Account and take a look at your Facebook Message History and see if you can find any past conversation with this particular Friend of yours. Open the Conversation and take a look at how the Name of this Person Appears on Facebook and try to tap/click on the Name of the person. Note: In case the Name of your Contact/Friend appears as Facebook User, it usually means that this Person has most likely deleted his/her Facebook Account.